Every year more than 33,000 table saw-related injuries are treated at emergency rooms across the nation, according to a 2007-2008 study by the U.S. Consumer Product Safety Commission (CPSC). More than 10 percent of those injuries result in painful and sometimes life-changing amputations. While the vast majority of table saw injuries are suffered in home workshops, on average, a saw-related workplace accident requiring medical attention occurs each day. CPSC observes that the number one contributor to table saw accidents involves saw blade guards “deliberately removed” by their users. Why? A common explanation offered by sawyers who partake in this dangerous practice is that the guard inhibits their view of the cutting action. Another reason often cited is that removal eliminates a workpiece from jamming between the blade and the guard. The CPSC is taking dead aim at reducing table saw injuries. The product safety agency is entering its fifth year of developing a table saw safety regulation that likely will lead to higher product prices. Safety Speed Manufacturing of Ham Lake, MN, offers practical and productivity enhancing solutions to facilitate shop saw safety for sizing panels via its extensive line of vertical panel saws. Renowned for their ability to perform accurate cuts in a small footprint, vertical panel saws are inherently safer than their horizontal counterparts for sizing panels because the operator’s hands are shielded from the spinning blade by a guard that is integrally attached to the saw carriage. Whereas a table saw operator pushes a workpiece toward and through a stationary saw blade, the enclosed saw blade of a vertical panel saw travels through a stationary panel. Another common accident risk associated with table saws is kickback, a violent reaction that results when a saw blade binds. When binding occurs, the workpiece suddenly reverses course and shoots like a projectile toward the operator. Houska notes that Safety Speed’s vertical panel saws are less prone to kickback. “Our precision production guide systems eliminate the need for a fence which is the cause of most serious kickback injuries,” he says. In addition, all Safety Speed vertical saws are equipped with riving knives, which further protect the operator in the event of a saw blade binding. “The use of a riving knife is the easiest and safest way to prevent binding,” Houska says. “This device, which is standard on all of our models, is a hook-shaped piece of metal that is mounted directly behind the blade. The riving knife helps prevent the upper and lower pieces of wood from binding together after the cut is performed. 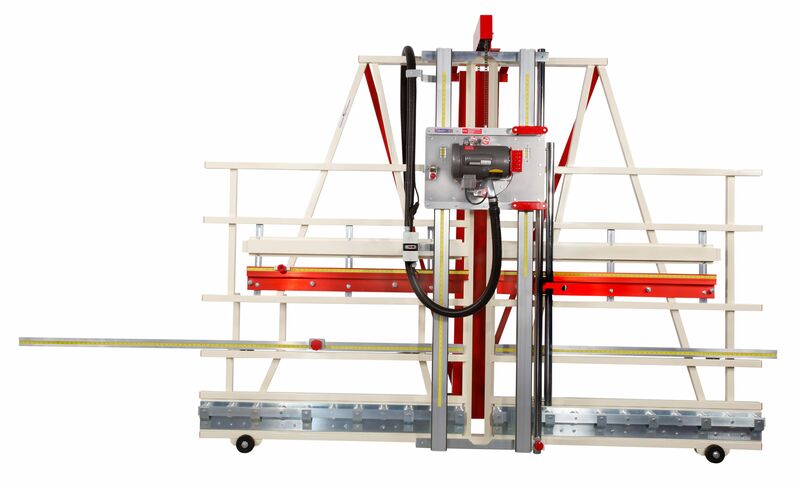 Houska notes that in addition to standard safety features like riving knives, some of Safety Speed’s vertical panel saw models offer special safety features. “Our C-Series and H-Series saws have large red stop paddle-style switches located right behind the operator’s handle. All the operator has to do is bump the stop paddles and it will quickly shut off the machine’s power. No matter how many safety features are engineered into its saws, Houska says it is very important that saw operators thoroughly read the owner’s manual before running the saw. A number of do’s and don’ts extracted from the manual are highlighted in the chart below. In addition, Safety Speed has produced several videos demonstrating safe operation and general maintenance of its equipment. □ Read the owner’s manual and make sure anyone else who will operate the saw does as well. □ Never let an unqualified or untrained person operate the saw. □ Always operate the saw in a clean and well-lit environment. □ Avoid operating the saw in damp or wet locations. □ Wear safety goggles or glasses with side shields. □ Do not wear loose-fitting clothing or jewelry. □ Wear a protective hair covering to prevent long hair from getting caught in moving parts. □ Never let the saw run unattended. Turn the power off; make sure it comes to a complete stop. □ Secure the work with a clamp, vice, etc. to free both hands for controlling the saw carriage. □ Do not alter the saw, remove guards or operate it when removed from the carriage and frame. □ Regularly inspect saw parts for misalignment, binding of moving parts, improper mounting, broken parts, etc. □ Do not operate when you are tired, distracted or under the influence of drugs, alcohol or any medication that causes decreased control. □ Unplug the saw before changing a blade or performing maintenance. □ Avoid cutting nails and other mechanical fasteners. □ Keep the saw blade clean and sharp. Doing so will reduce the chance of kickback. □ Do not use a push stick.